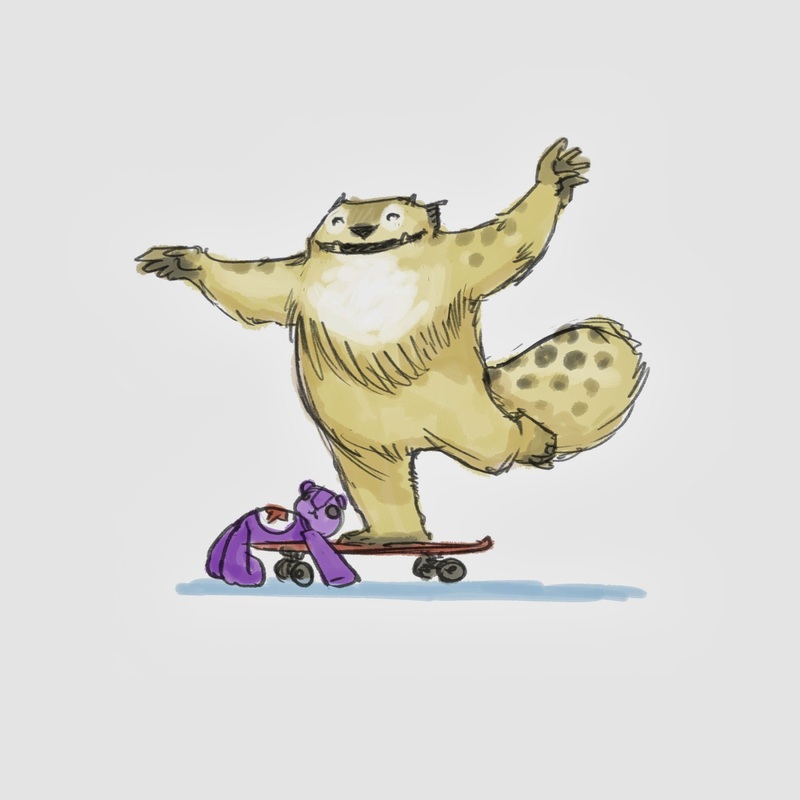 Okay, so here's step 2 of my Yeti illustration. A slight watercolor wash. Just two colors, brown and blue, to fill out some of the shapes and give it a little texture. 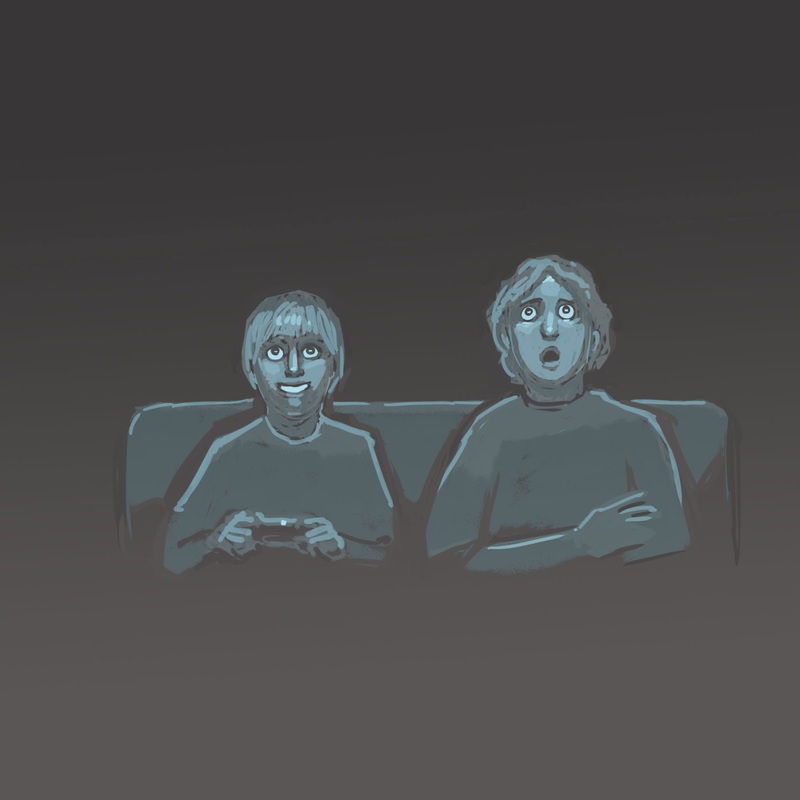 The image is now a mid-tone that I can work lighter and darker. 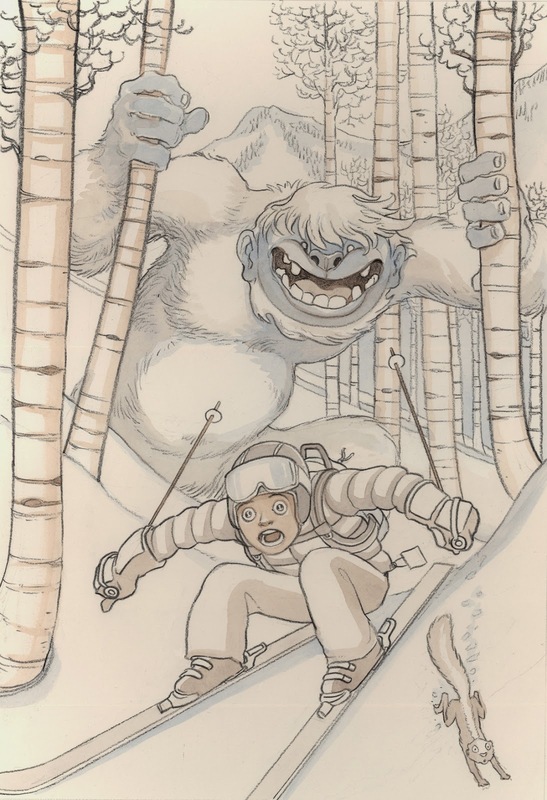 I'm starting to realize painting a Yeti in the snow, among white trees, is sort of like the old "polar bear in a blizzard" painting. From here on out, the painting will go digital. I may try a few different lighting scenes, to see what works best. 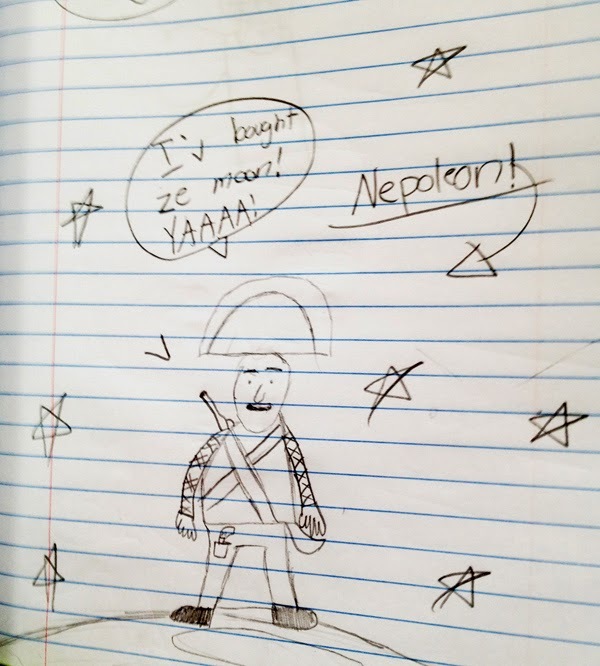 This drawing was shown to me after a school visit about Napoleon, Jefferson, and the Louisiana Purchase. It is by a 4th grader who enjoyed the assembly. If you can't read it, it says, "I have bought ze moon! YAAAA! I like the little pistol pocket. Who am I kidding, I like EVERYTHING about this. I happen to be traveling at the moment and I don't have access to my scanner or my handy-dandy computer drawing system. My plan was to draw some blog posts with my iPad this week, but I'll start that tomorrow. Today, I'm giving you a rare peek into my school visit presentation. Since getting into graphic novels and US history, my school visit audience is usually 3rd-8th graders. I don't visit many K-2nd grade classes anymore--which I did when I was doing mostly picture books. Today was fun, though, because I got to do my old picture book presentation. The finale is a group effort where the students help me draw a monster, or, since it was St. Patrick's day, a leprechaun. I have a marker and an oversized piece of paper on an easel. I start with the head, and take suggestions for each monster part down to the feet, and then we name him/her/it. Since these are leprechauns, they all have the classic hat and belt--and a last name starting with "Mc". 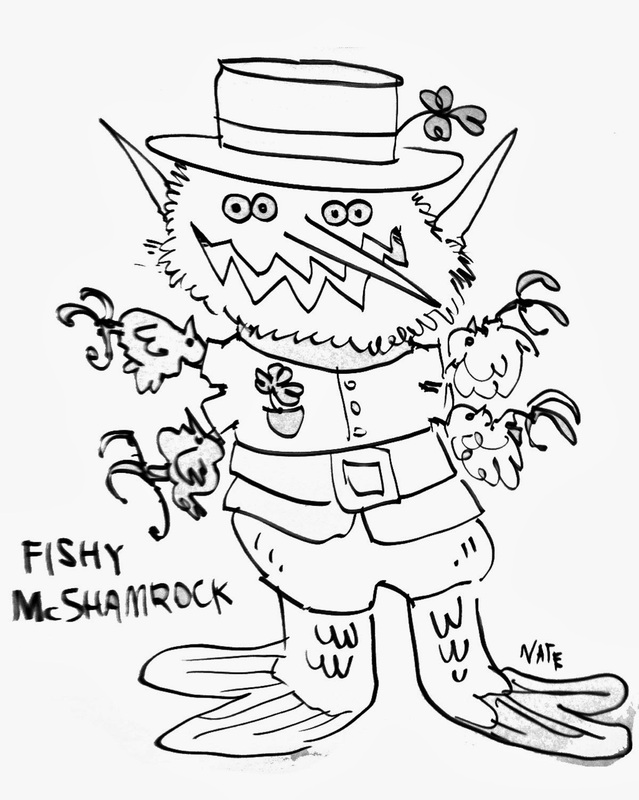 Fishy McShamrock has chickens for arms, and fish tails for feet. 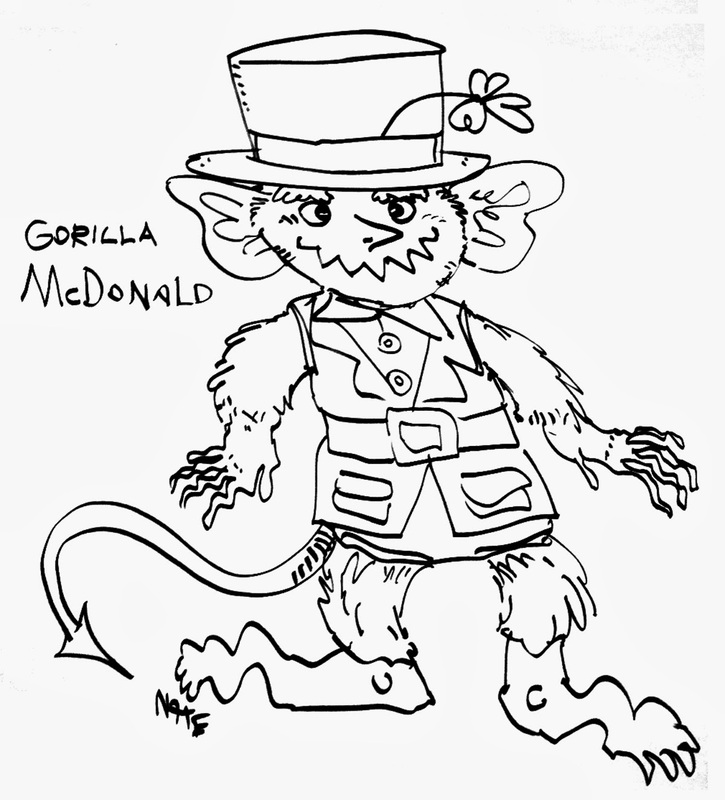 Gorilla McDonald has "wavey" fingers, and also "wavy" feet. 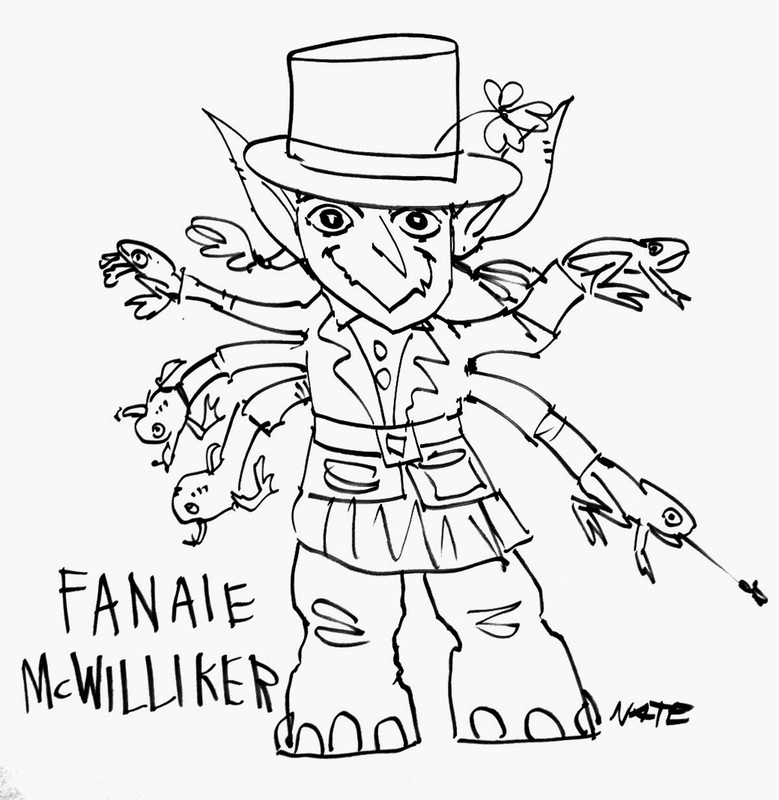 Fanae McWilliker has five arms and frogs for hands. We couldn't figure out how she eats with frog hands, or if she feeds herself by letting the frogs eat. 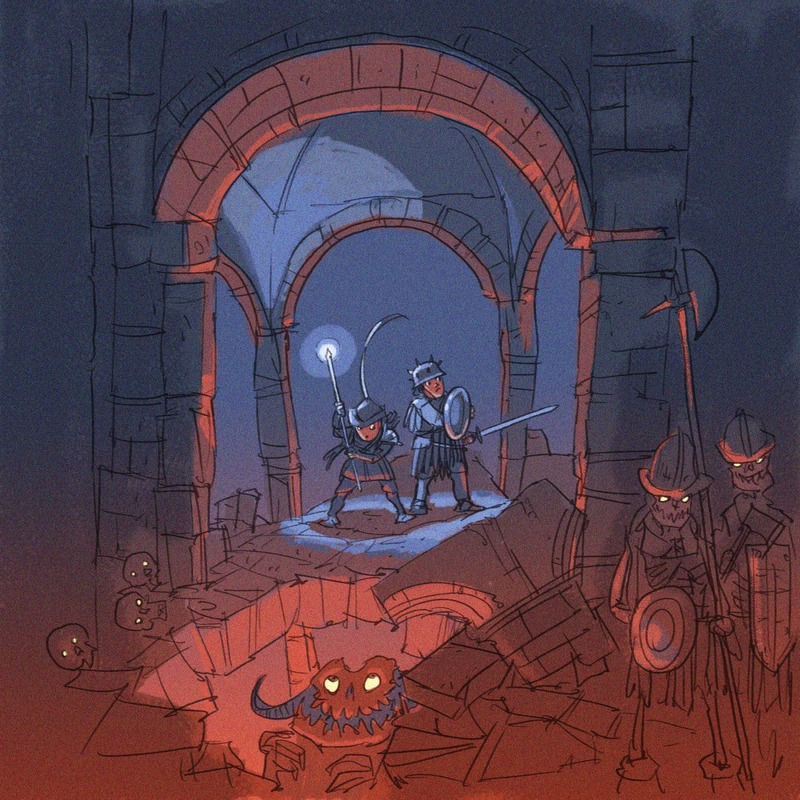 I've done this drawing exercise with kids for years. It's very strange to see the shifts in specific body part requests. 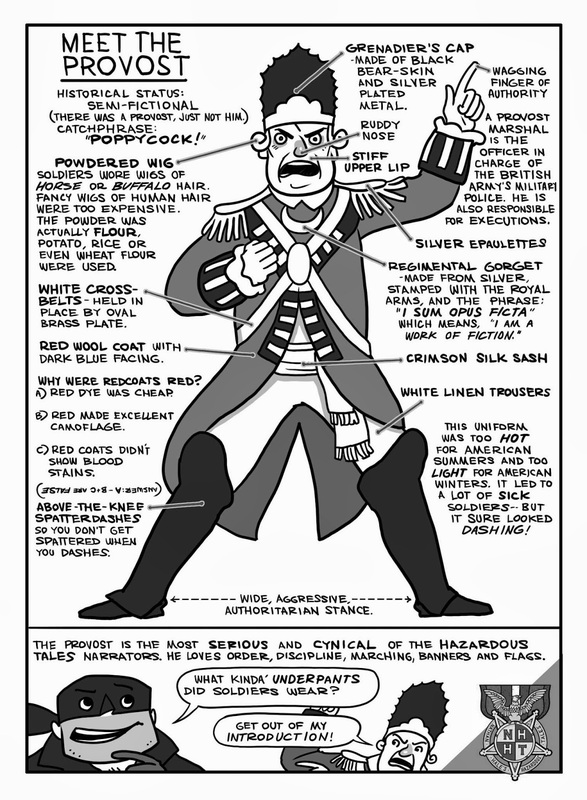 Four years ago, there was not a SINGLE monster that didn't get a "Uni-brow". Kids were insane for the "uni-brow." More recently, it's been mustaches. Today's had a strange similarity, pointy noses and zig-zag mouths. All three groups, not knowing what the other groups had chosen, asked for those two traits. 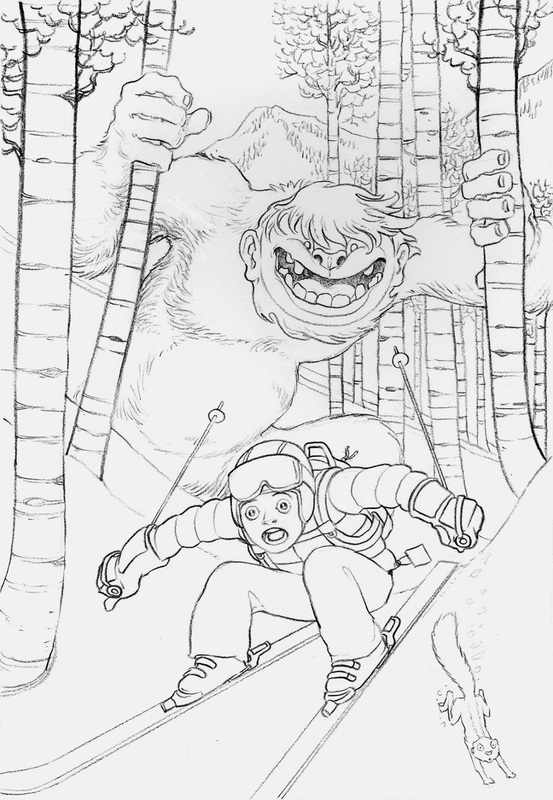 I drew them differently, so the monsters--I mean leprechauns--would be different when seen together. Another odd similarity is animals for limbs. I was stunned at the weirdness of "chickens for arms", and then the third group asked for "frogs for hands." I don't know what any of it means. But it's interesting. As I'm posting these leprechauns, there are a few hundred 2nd graders who are writing stories about them for homework. The frogs for hands issue is now theirs to work out. One Dead Spy is now on it's second week on the NYT bestseller list. We've moved up to #4! 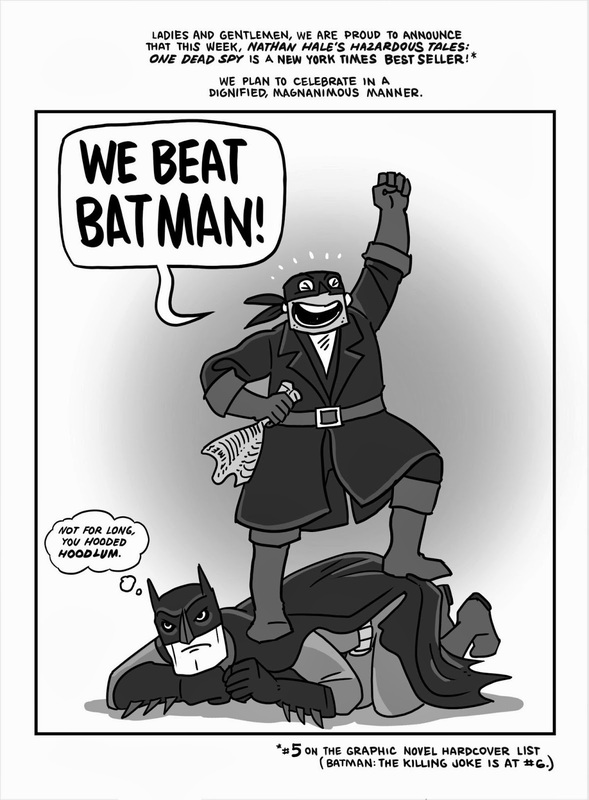 And Batman got his revenge (a Batman book has jumped to #3). 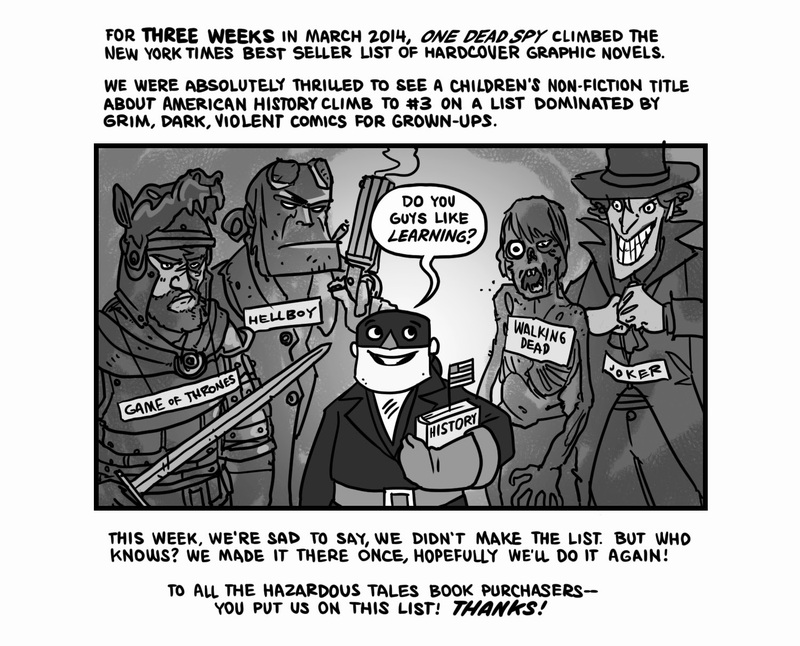 Along with our celebration, we'd like to send out a big THANK YOU to everyone who bought ONE DEAD SPY--you put us on this list! This is the New York Times best-seller list for graphic novels (hardcover). Our Dark Souls II special edition arrived. We stayed up way too late playing. We launched Rapunzel and watched to see if other publishers would print large too. They did not. Everybody went smaller--this was right when the Wimpy Kid books started blowing up. That size, or thereabouts, became the golden size for middle-grade books. One theory was that kids thought of large books as picture books--in other words, large books were for little kids, little books were for large kids. Middle-graders want to be anything but "little kids." The middle-grader graphic novel shelf shrank to fit the smaller-sized books. Some of these shelves were too small for Rapunzel. In the end, the alternate cover idea didn't take, and we stuck with the old, classic covers. Now you know the story! What do you think of the new small versions? This chimp is wondering why I'm rebooting the blog with such a boring story. 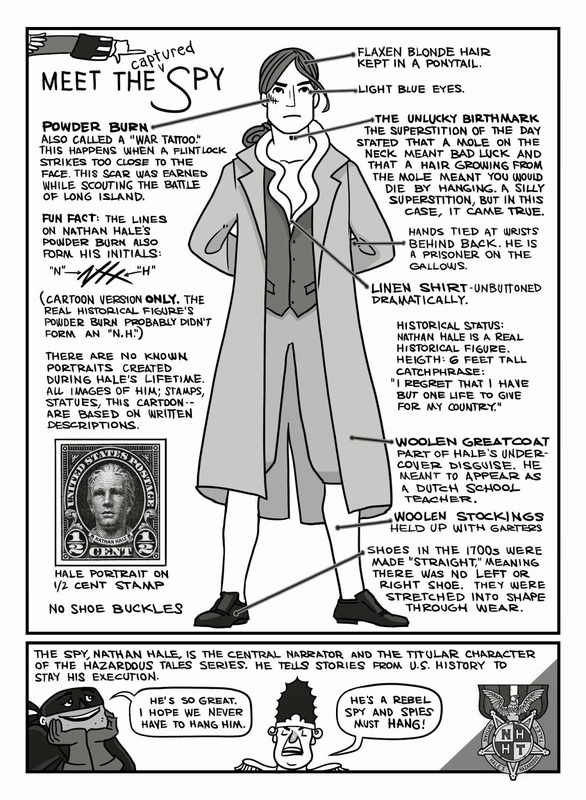 C'mon, guys, nothing is more interesting than graphic novel format sizes! 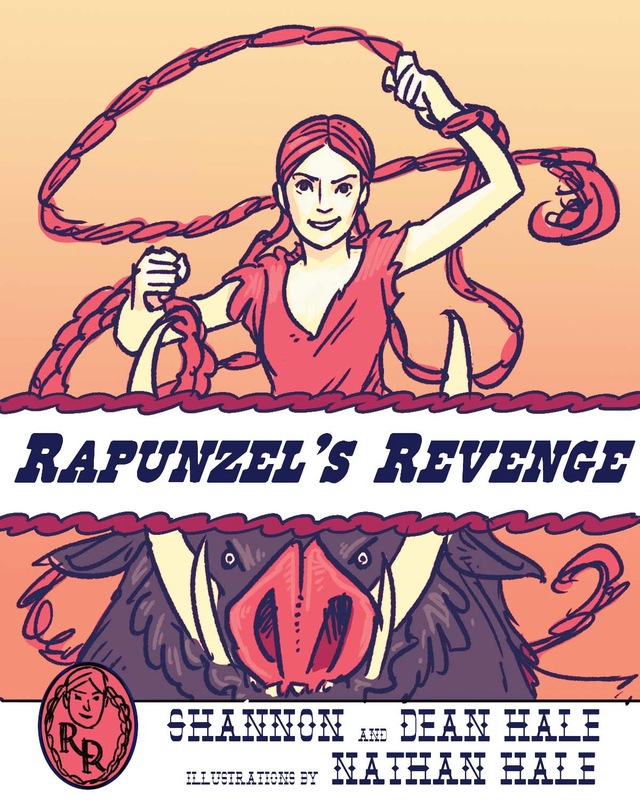 When we started Rapunzel's Revenge, I had never drawn a graphic novel, Shannon and Dean had never written a graphic novel, and Bloomsbury US had never published a graphic novel. We had to make it up as we went. Scholastic's books were somewhere between the American and European size--but many of them were black and white (like Manga). Scholastic learned pretty quickly that kids wanted COLOR. The BONE reprints, originally done in black and white, were soon brought out in color versions. BABYMOUSE was Manga-sized, black and white, but with one extra color (pink!). Amazingly, the one extra color worked! 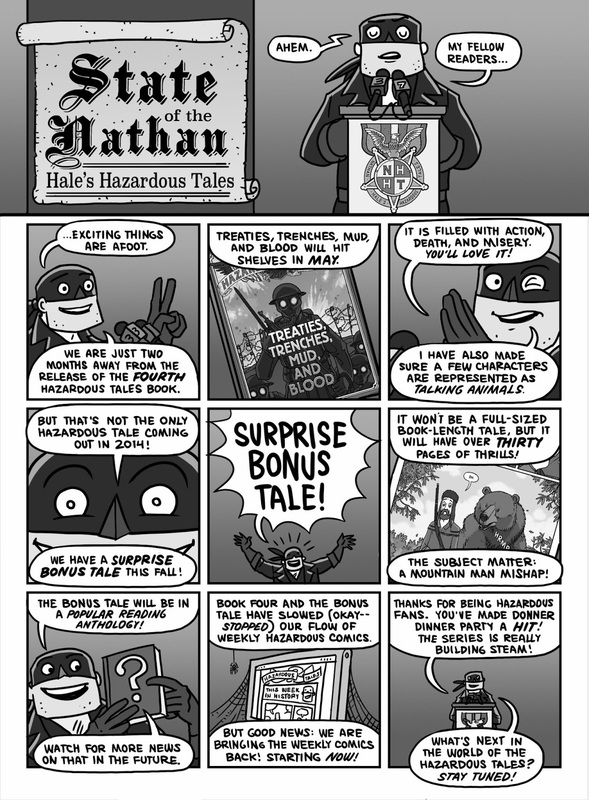 It worked so well, in fact, that many middle-grade graphic novels have since followed that format: Lunch Lady, Dragonbreath, and a little series you might have heard of called Hazardous Tales. 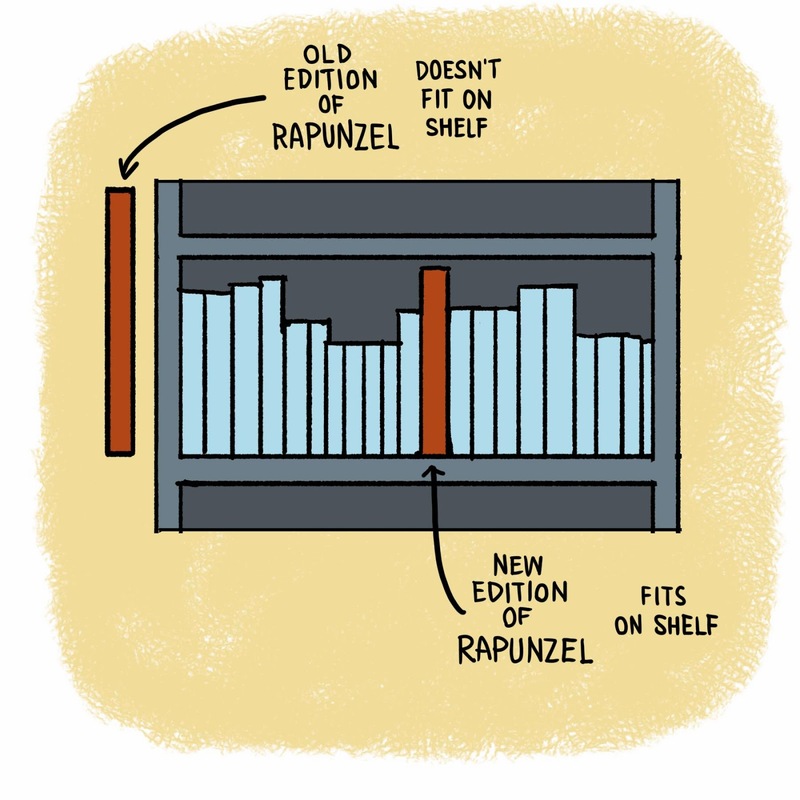 So, before we started Rapunzel, we had to decide what size the book would be--and if it would be in color. 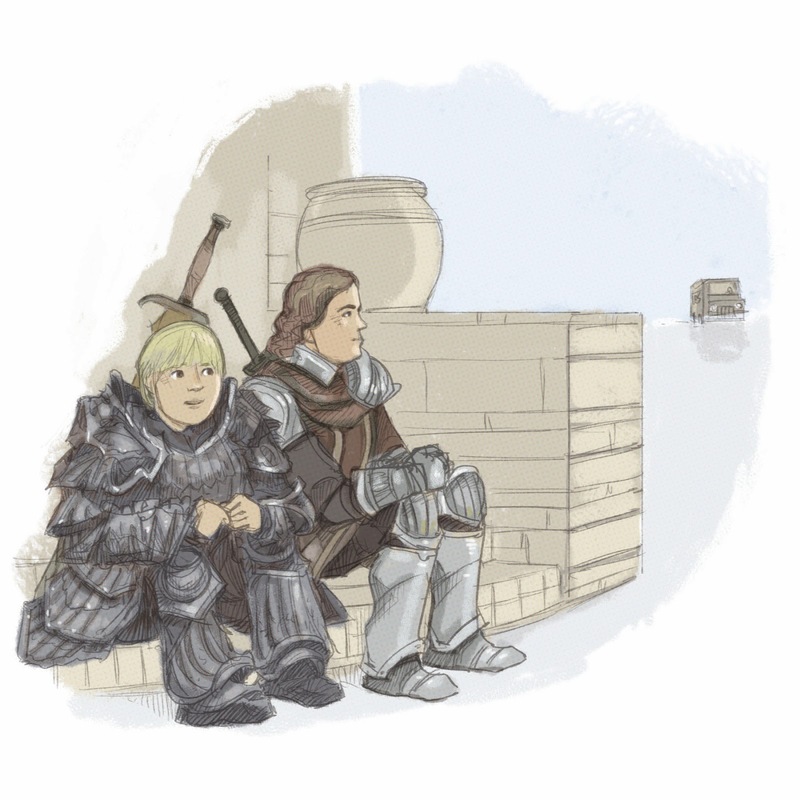 After finishing the inks, I admit, I sent an email requesting the book be black and white. Can you imagine Rapunzel's Revenge with no color? Size-wise, I wanted to go as big as possible--having long been a fan of the super-sized European-style comics (think Tintin and Asterix). Shannon and Dean's script had a lot to say, and I had a lot of scenery I wanted to draw. We went as big as the publisher allowed: not quite as big as the Europeans, but a bit larger than the Scholastics titles. 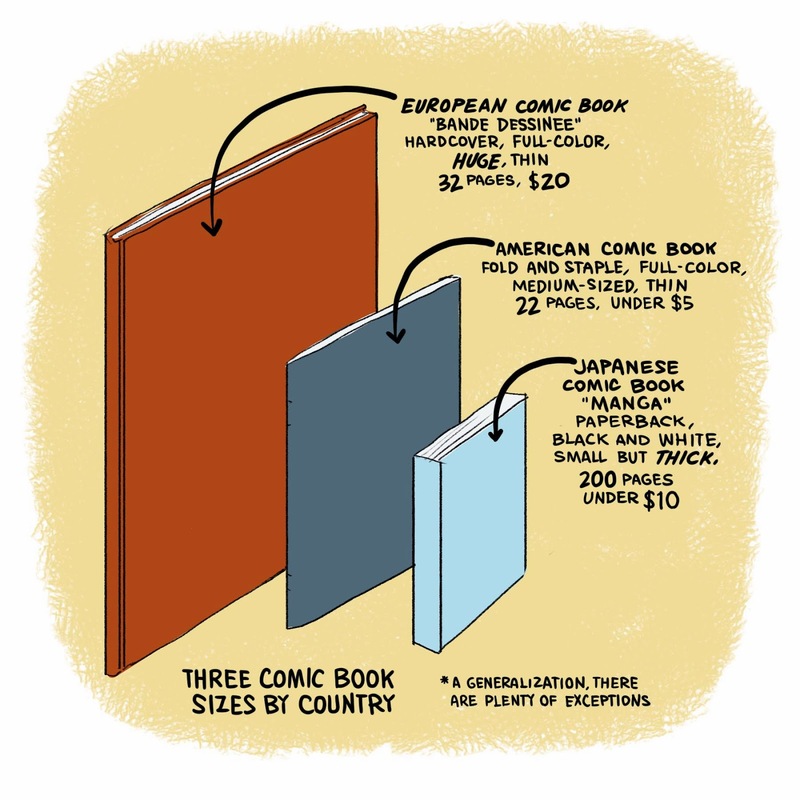 We went full color, bigger and thicker than a standard American comic book, but not quite as thick as a Manga. Essentially, we created our own new size and format--a size and format nobody else was using. After being out of the blog-o-sphere since last summer, I'm jumping back in! Wish me luck. I'm going to attempt to maintain my old pace of every weekday. 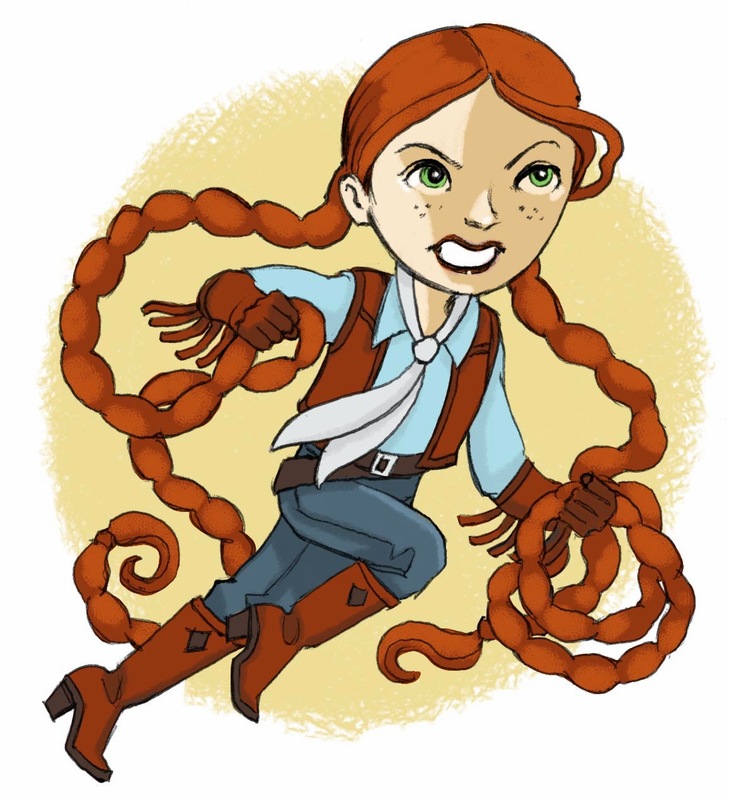 This blog has brought me a lot of joy--and more than a few contracts (including the one for the Hazardous Tales books!) So back to business!